Pie | And sometimes I cook. Kathryn Anderson of Wallkill, NY submitted this recipe to Taste of Home. In a small bowl, combine coconut and butter. Press onto the bottom and up the sides of a greased 9″ pie plate. Bake at 300 for 30-35 minutes or until lightly browned (cover edges loosely with foil to prevent overbrowning if necessary). Cool on a wire rack. 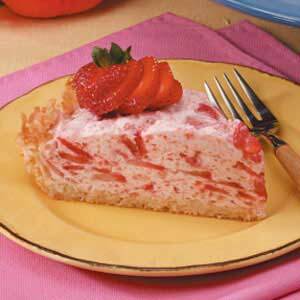 In a large bowl, combine strawberries and sugar; let stand for 15 minutes. In a small saucepan, sprinkle gelatin over cold water; let stand for 1 minute. Cook and stir over medium heat until gelatin is dissolved; stir in lemon juice. Stir into strawberry mixture. Cool to room temperature. Fold in whipped cream. Pour into crust. Refrigerate for at least 4 hours before slicing. 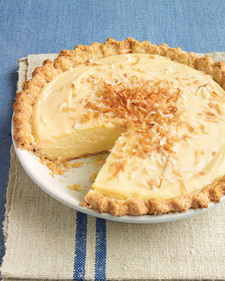 Martha Stewart’s tip: To toast the coconut, spread it on a rimmed baking sheet and bake at 350 for 5-10 minutes. 1. Heat oven to 400. Press a sheet of foil onto crust, draping over rim of pie plate. 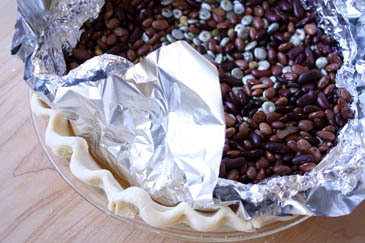 To blind-bake: Fill with dried beans or pie weights. Bake until crust is lightly browned, about 45 minutes. Remove beans and foil; let crust cool completely, and set aside. 2. While crust is baking, place a fine-mesh sieve over a large bowl; set aside. In a medium saucepan (off heat), whisk together sugar, cornstarch, and salt. Gradually whisk in whole milk, making sure to dissolve cornstarch. Whisk in coconut milk and egg yolks. 3. Whisking constantly, cook over medium heat until the first large bubble sputters, about 5 minutes. Reduce heat to low; cook, whisking constantly, 1 minute. Remove pan from heat; immediately pour custard through sieve into bowl. 4. Pour custard from bowl into cooled crust; smoot top with a rubber spatula. Refrigerate until chilled, at least 4 hours (or loosely covered, up to 1 day). To serve, let stand at room temperature 30 minutes, then sprinkle with coconut. I’ve had this recipe for over 12 years. I love it. It came from a Taste of Home magazine from Jeanne Freybler of Michigan. In a large bowl, combine fruits and extract; toss to coat. In another bowl, combine sugar, tapioca, nutmeg and salt. Add to fruit; stir gently. Let stand for 15 minutes. 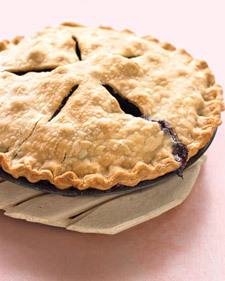 Line a 9″ pie plate with bottom crust; trim pastry even with edge. Stir lemon juice into fruit mixture; spoon into crust. Roll out remaining pastry; make a lattice crust. 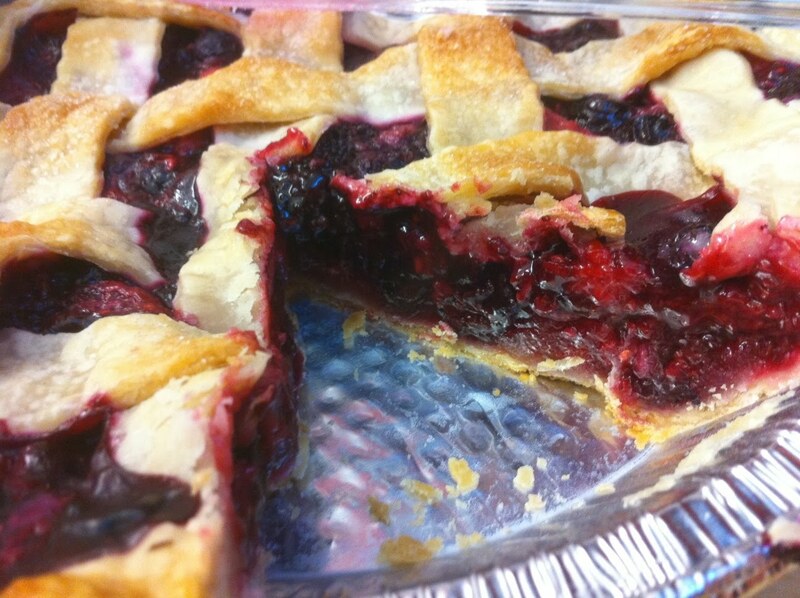 (Tip: wider strips make a lattice crust easier. For a reminder on how to make a lattice crust, click here.) Seal and flute edges. Bake at 400 for 20 minutes. Reduce heat to 350; bake 30 minutes longer or until crust is golden brown and the filling is bubbly. I love pie! This one is Martha Stewart’s. 1. Heat oven to 450 with rack in lowest position. Prepare 9″ pie plate with bottom crust. Refrigerate. 3. Place pie on a rimmed baking sheet. Bake 30 minutes; reduce heat to 375. Bake until crust is golden and juices are bubbling rapidly all over, 60 -70 minutes more. If edges are browning too quickly, tent with foil. Transfer pie to a wire rack & cool to room temperature, at least 6 hours. 1. In a food processor, combine dry ingredients and pulse briefly. Add butter; pulse until mixture resembles course meal, with a few pea-sized pieces of butter remaining. Sprinkle with 1/4 cup ice water. Pulse until dough is crumbly but holds together when squeezed (if necessary, add up to 1/4 cup water, 1 Tbs at a time). Do not overmix. 3. On a floured piece of parchment paper, roll one disk of dough to a 14″ round. Wrap dough around a rolling pin; unroll over a 9″ pie plate. Gently fit into bottom & sides of plate (do not stretch dough). 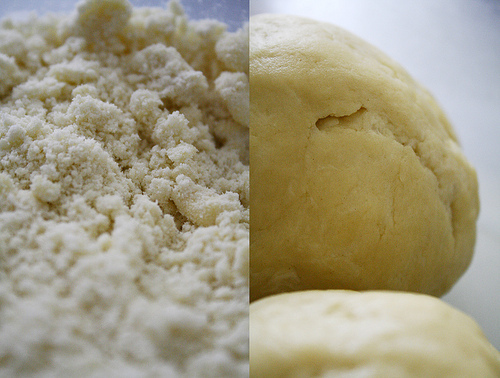 Using kitchen shears, trim dough to a 1″ overhang all around; refrigerate until ready to use. Reserve and refrigerate remaining disk of dough for top crust.